View all 31 Days of Doll Making posts here. UPDATE: This pattern is available now HERE. I bought this Babyland Rag doll back in 2008 on Ebay. Yesterday's post is about finishing things, right? It's now 2013, right? When she was on Ebay, I saw that she was a Babyland Rag who had lost her face. 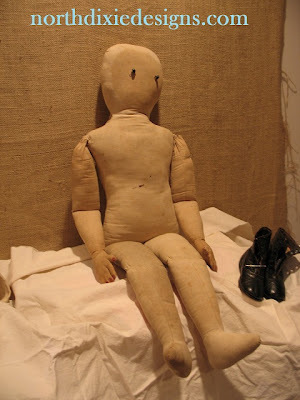 Some ingenious mama or grandmama turned the body around, reattaching the limbs and giving her a button eyes. The doll has since moved on, but when I had her I drafted a pattern based on her. She is a BIG doll at 30". I will be releasing a PDF pattern for the body ONLY for this original Babyland Rag 30" doll shape. There will be no patterns for clothing and no instructions for doing the face. Just a Simple Doll Pattern. I am going to call my pattern an Antique Rag Baby (based on a 30" Babyland Rag) and will offer a 30" size and a roughly 14" size as well in the pattern. The beauty of the large size is it can wear children's clothing. This pattern will be ready within a week. Because I just wrote a post about the Art of Finishing yesterday. So stay tuned. I am doing a 3rd test of the pattern right now. Judi Ward has a 14" Babyland Rag pattern which shows the technique of applying the 2nd face to the basic rag doll pattern, I would look into her pattern. You can buy Judi's pattern here. There is also a post on Maida Today showcasing how the original Babyland Rags were constructed. You can view the post showing Babyland Rag face construction here.